It is impossible to attempt a review of Vikram Seth's A Suitable Boy without commenting on its length. This book is immense. Almost 1500 pages of very small font. I started it around Memorial Day and finished it on August 1st. I don't know the last time I ever felt so accomplished for finishing a book. I read George Eliot's Middlemarch earlier this year, and it's also impossible not to compare the two books. Both are very long books that follow many characters but focus on a few key ones. Both are set during a volatile time in history and are steeped in their settings. Both discuss the impact of a new piece of legislature that would take power away from landowners and give it to the peasants. Both are about the relationships that exist within families and between people. 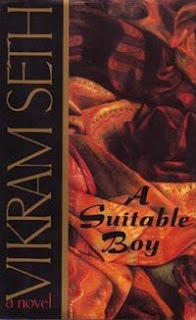 They're very similar, but I enjoyed A Suitable Boy more. Perhaps because it's set in a more modern world but written in a sprawling, unhurried manner. Perhaps because it's set in India and I enjoyed the references to customs and clothing and food. Perhaps because I vastly preferred Lata to Dorothea (sorry, Middlemarch fans, but Lata is great and not nearly as martyr-esque). I honestly don't know how to review this book because there is so much in it. No matter what I say, I'd give away some sort of spoiler. And what I want to talk about is hard to address with someone who hasn't read the book. I understand now why my friend wanted me to read the book and discuss it with her because it's a novel ripe for discussion. So many Indian authors write books that are melancholy and cynical. That is not what Seth has done here, though certainly, melancholy and cynicism are present. But this book is much more a love letter to a country in flux and coming into its own while holding onto its past, trying so hard to shape ideals without losing its colorful traditions. I enjoyed reading this book because it highlighted so many of my own conflicting feelings towards India. I love the festivals, I love the deep-rooted sense of hospitality, I love the weddings, I love the support that friends and family provide to each other in a way I've not seen in any other culture. But I hate the religious problems, the caste system, the treatment of women, the inefficiencies and corruption. When reading A Suitable Boy, I had the sense that Vikram Seth understood my complex feelings for the country and the novel is his (very successful) attempt to showcase his flawed but beloved India to the rest of the world. Seth brought to life so many holidays and celebrations and traditions - I loved reading about Holi in particular. He also highlighted just how complicated friendships across religious and political lines could be in the post-Colonial era. And, in the midst of so much change and drama and trauma, there are characters just going about their lives, trying to make the most of what they have. This isn't an easy book to read, but that is due so much more to its length than to anything else. It's eminently readable, if you are willing to give it the patience and attention that it deserves. It took me over two months to read it, and I admit that there were times when I was frustrated with the length and felt like I would never be done. But once I was done, I was sad to leave behind the friends I had gotten to know so well and disappointed not to learn what would happen next in their lives. Wow, Aarti. I've never considered adding this to my tbr list. Now after reading your great post, I feel like I need to read this. Oh, I'm so glad! It's a chunkster, definitely, but the writing really draws you in, and it's the sort of book you can meander through slowly. It's a good one to purchase and take your time with - not to get from the library and force yourself through quickly! I also loved this book, but was at times baffled by the politics. I skimmed a lot of those sections, and now I feel as though I should go back and read the book again, but frankly, the length frightens me. I do think I still have this one though, and must admit that although I read it many years ago, it was the book that gave me a deep love of Indian Literature. Great reviews and no spoilers! I definitely skimmed a lot of the political stuff, too, Heather. I did that for Middlemarch as well, though there was much less in Middlemarch than in here. Even so, the parts I *did* read were good! Congrats!!! I think reading TWO huge books in one year like this is an amazing accomplishment and I'm not surprised that after spending so much time with the characters that you miss them. I don't know if I'll ever attempt this book, but I really appreciate everything you've said about it here and this was the first time I felt slightly tempted by it. I think it must be a wonderful feeling to have an author capture your own feelings about India in a book and do it in a way you love. Will you read the sequel if it ever comes out? You're right - between Middlemarch and A Suitable Boy, that's a lot of shelf space! Ah, you beat me! And by quite a lot too - I am only on page 500ish. I'm glad that you enjoyed it, I haven't read Middlemarch but so far it reminds me of Anna Karenina because of the epic-ness of it and all the families. I'm really enjoying my time with this book - the characters are starting to feel like old friends. Now I want to read Anna Karenina! I know how long the cover's been on your reading list, so that it's 1500 pages of small print doesn't surprise me. I like what you've included, and you saying that to talk about it would mean spoilers makes it sound as you said - difficult for the length, but readable. I think I'll still give Shogun a go first, but if I manage that with its 1100 odd pages then I'd love to read this book afterwards. It was on there FOREVER, wasn't it? But now it's off! Ok, I am really glad to hear that I am not the only person who got bogged down by the political parts of this book. I took it on vacation a few years ago and really loved it, but then around the 300 page mark, there were these huge swaths on politics that just bored me to death! Even knowing I am in good company, I am a bit ashamed to admit that due to those parts, I gave up on the book... I do hope to try it again one day (maybe when we make it to India? ), and I guess when I do, I will give myself permission to skip the politics parts! Oh, that is ok! I give up on lots of books ;-) Or just skim liberally. You make me want to read it! Despite the length. 1500 pages? Urgh. Isn't IT pretty long?! And all those other books you convince people to read with catchy jingles? You can do it! I'm just finishing up a 600+ page book right now, so I have to give you credit for reading one more than twice that length. You are a braver soul than I am, and I'm glad you enjoyed it...especially after all the effort you put into it. Yes, it was a labor of love, but still very laborious! I saw this book in the bookstore once and was just amazed at its weight and heft and length. It is daunting -- the ultimate chunkster. I'm glad to hear it is worthy of reading, and I have to say I hope you were able to read it on an e-reader or something. It sounds like it is a love poem to India in many ways -- celebrating all its flaws and wonderfulness. Well done -- and I'm glad you have a friend to discuss it with. Nope, no e-reader for me! I read the ultimate chunkster in paperback :-) Thank goodness it wasn't a hardcover! I read this a few years ago but I really loved the immersion into the book I felt. I'd never really been so inundated with Indian culture before and I loved feeling like I was learning about that while I was enjoying myself. I also just adored the characters. I'm glad you enjoyed it too! Yes, so many of the characters were glorious! Others, not so glorious. But memorable all the same. There are parts of this book that pop into my head randomly; bits of dialogue that flash across my mind and then change my emotions for the rest of the day. If I think about Mishra in the tub, covered in pink, I giggle out loud (and make people think I am crazy). I love that this book does this to me. I am so glad you read it, it is probably my favorite book of all time. That doesn't surprise me about you because you remember SO MANY DETAILS of every book you read! That was a good scene, though ;_) Mishra was so oily nasty, he deserved it! Congratulations on finishing this tome! I've seen quite few bookish people reading this, but I can't muster up the courage to start. Also, I first have to continue/finish 1Q84, which is probably going to be my only huge book for this year. Your impression of the book is encouraging though :) Maybe next year! I started to read this a few years back, made it 500 pages in, then stumbled on a spoiler about who the "suitable boy" is. I haven't forgotten yet. *stamps foot* Nor have I given up on reading it though, because after all reading 500 pages of something is the same as finishing a couple of shorter books: I'm not quite ready to give up yet! Grrrrr. I've had this on my bookshelf for a long time, too - I'm pretty much terrifed of it. =) Of course, now that you say it's good, I will have to read it eventually.